Radio Ballad No 1 - Parker, MacColl, Seeger, etc. "John Axon was a railwayman ... " and, on 9th February 1957, he was making the down-run from Buxton to his home depot at Edgeley, when the automatic steam brake pipe developed a fracture. The cab filled with scalding steam. Axon told his fireman to jump clear and then elected to hang on to the outside of his cab in order to warn men in signal boxes along the route. Axon was killed, although his actions apparently saved the lives of an entire trainload of children. 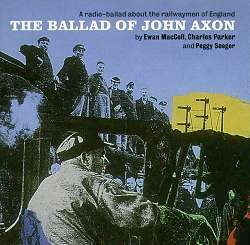 Two weeks after the announcement of the award of Axon's posthumous George Cross for bravery, the BBC commissioned Charles Parker and Ewan MacColl to produce a documentary about Axon's heroics and this eventually became the first radio-ballad - The Ballad of John Axon - what Parker refers to as a 'narrative documentary' with words of actual participants, sound effects recorded 'on the spot' and songs based on these recordings. After the first transmission, The Observer wrote "Last week, a technique and a subject got married and nothing in radio kaleidoscopy, or whatever you like to call it, will ever be the same again". There were seven more radio-ballads and, in the intervening years between the last and the present Topic CD reissue of the series, they have never been forgotten. They have been remembered in awe, spoken of as classics. When I attended a course in the early '70s on radio production, they were held up as the epitome of the art form and Parker himself was brought along to address us. A little while ago, during some BBC anniversary celebration or other, Singing the Fishing was duly trotted out in a series of 'classic features from the sound archives'. At the time, however, the BBC's attitude to the programmes was ambivalent. There were in-house complaints that Parker made 'disproportionate demands upon resources'. Perhaps this was after the incident when Parker actually broke into the BBC one night to continue editing. Despite the fulsome praise of the world at large, the BBC was lured by the promise of cheap programming (does this sound familiar?) and closed the radio-ballad unit. They were undoubtedly expensive to produce and, according to MacColl in his autobiography, listener research figures showed that disc jockey programmes of popular music appealed to far larger audiences and for a fraction of the cost. The Observer again: " … if this is the best reason anyone could produce for the act of murder … it is a miserable one". End of radio ballads 1964; end of Parker's job at the BBC 1970. A matter of control, really - production companies have always disliked artistic control - by the artist. Parker in 1970 went the same way as Orson Welles in Hollywood in 1940 after the debacle over the masterpiece Citizen Kane. At its conception, this first radio-ballad was intended as something quite different, something more conventional. Only after returning from the field with between 20 and 40 hours (reports differ) of recorded interviews with Axon's widow, fireman and workmates did the idea form of using these recordings rather than scripted versions of them using actors. It is these recordings, used extensively throughout, that made the programme unique at the time, that really made 'the everyday significant' as John Grierson said. In fact, throughout this programme, I am constantly reminded of the work of John Grierson at the GPO Film Unit, sometimes in collaboration with Auden and Britten, on such short films as Night Mail and Coal Face and the technique in these films of mixing real people, music, poetry, reconstruction. Grierson's work can hardly have gone unnoticed by the likes of Parker and MacColl. Once the format had been decided, John Axon cannot have been too difficult to develop. (The hard work would come later in the studio and editing room). As MacColl said, the story is highly dramatic, it possesses a built-in chronology and a natural dramatic climax. The train is, of course, a godsend to the songwriter with its built-in rhythms and speeds. MacColl apparently wrote the songs in ten days. Peggy Seeger was invited to write accompaniments, compose incidental music and order the actuality pieces. It is a pity that the majority of the songs are influenced by the American tradition rather than the English. Even MacColl sounded a note of regret about this in his autobiography. It would not, I suppose, have sounded strange then, but it jars a little now that a documentary set in England, with English voices and descriptions of English pastimes and English values should have American influenced songs. There is even a pastiche of American prison work songs. At one point, in the song beginning "The repair was done…", MacColl even seems to effect a curious American accent. I could be wrong - I've always had a bit of trouble with his accents. It was the actor in him - the artist. MacColl certainly had artistic pretensions and I feel this lets him down here at a crucial moment. The mix of words, songs and effects works wonderfully well most of the time but I feel that the full horror and tragedy of the moments leading up to Axon's death and the moment thereof become rather lost under MacColl's desire to be artistic. It just gets the better of him at the wrong moment and it starts to sound a bit like amateur theatricals. There's also a bit too much technical information as Axon's death draws near and the impact of the latter is lessened as you try to come to grips with the former. This is not to detract from what has gone before; for most of the time, this is an exhilarating piece of radio, far more exciting in its use of the potential of the medium than much of what we hear today. The programme opens and closes with the theme song of the piece which recurs throughout to comment on and push forward the action. After the initial verses, the clipped tones of a standard BBC announcer of the day tells us we are to hear the story of a train collision and the death of driver Axon. He stresses it is a real life story "told by the men who knew him and worked with him and set into song by Ewan MacColl". One of my gripes here is that these men (and a woman!) are never credited. Without the recorded testimony of Ron Scanlon (Axon's fireman), drivers Jim Howarth and Jack Pickford and Axon's widow (who is, as far as I can see, not given a name even in the sleeve notes) and all the other contributors recorded in the field, there wouldn't have been a radio-ballad at all, just a collection of songs. I suppose these people never had a credit? - the CD does end rather abruptly after the musical credits. These people really are the backbone of the piece. How effective would it have been without quotes such as this from Jim Howarth: "The old railwayman, it was a tradition. It was part of your life. Railways went through the back of your spine like Blackpool went through rock". Sure, these people are acknowledged in the current CD sleeve notes, but were they in the actual programme? After the opening song and announcement, we get the first train sound effect coupled with music from trumpet and drums and a song (no titles are given anywhere here for the songs) simulating the rushing of a train and the rushing of Axon to his doom: "It's hell on the plate, it's a funeral plate, oh Johnny / It's the end of a dream in steel and steam, oh Johnny / There's life ahead but you'll never see it, Johnny". This whole combination is cleverly repeated at the end as Axon hurtles to his death. The trumpets and drums are joined by other instruments and the music turns into a wild trad jazz bash indicative of chaos, mental and physical. Other songs, tunes, instrumentals and sound effects are repeated or manipulated to achieve the desired effect. And achieved the effect well and truly is. There are some heady mixtures of effects, music and speech that severely affect the hairs on the back of the head. The whole construction of the piece is a classic of its kind. A song tells us who Axon was; an announcer and a song tells of his death; a flashback to arriving at work that morning: descriptions in words and song of a life working on the railways; accounts of holiday pastimes and Axon's character; the fateful journey; the repeat of the death song bringing us full circle. All this told by real people involved with Axon and his work and by MacColl and Seeger in their words and music. MacColl said that he wrote the songs "conceiving each song either as an extension of a specific piece of actuality or as a single frame for a collection of actuality pieces". The nature of the beast is that the songs will take over. But while there is more song than speech, it is the latter that I remember when it is over. The voices sound so wistful, so sad. Axon's widow (how I wish I knew her first name!) describes her husband's love of rambling (giving rise, incidentally to the programme's hit song :"I may be a wage slave on Monday…"), dancing, party-going; his workmates talk about him in glowing terms, how he "made the day seem short while you were at work". Some of these recordings sound a little stilted, but we are told in the sleeve notes that some of them had to be recorded several times because of extraneous noise. The one false note struck in the actuality recordings is in the segment about the children, which sounds as if it has strayed in from another documentary. A small boy sings a verse ("Steam train, steam train…") in a rather upper class accent and is then joined by others singing street songs about trains. These do not sound authentic to my ears and I suspect they were written by MacColl and recorded in the studio. This whole segment also outstays its welcome. Reservations aside, and they are small reservations indeed, this programme stands up remarkably well forty one years after the first broadcast and is a remarkable achievement for all concerned. The audio mix of the programme is astonishing when you consider the primitive technology that was available in the late 1950's. I know technicians no longer use razor blades and cellotape, but I bet the end result couldn't get much better than this.